van der Linden et al 2010 extend the work of Musek (2007) by presenting a meta-analysis of Big 5 intercorrelation matrices in order to assess the evidence for a General Factor of Personality. Table 2 shows the meta-analytic average scale intercorrelations for the big 5 measures included in the meta-analysis. It shows how across a wide range of measures and measurement procedures, the Big 5 scales moderately intercorrelate. The average absolute unadjusted correlations between the Big Five was 0.23. You can also check out other work discussing higher-order factors (typically one or two factor models). These imply a correlation between the Big 5. Researchers have posited one and two factor higher-order models of personality suggesting that the Big Five may not be the broadest meaningful level of personality analysis (Anusic, Schimmack, Pinkus, & Lockwood, 2009; Digman, 1997; Musek, 2007; Veselka et al., 2009). Notably, a single, broad factor (termed the General Factor of Personality; GFP) has been proposed to account for meaningful trait variance at the highest level (e.g., Musek, 2007), although see various critical perspectives (Davies et al., 2015; De Vries, 2011; Revelle & Wilt, 2013) . Thus, you could check out those references for further background on one and two-factor models. Such papers will generally also discuss the structure of correlations between the Big 5 and arguments for and against why they are meaningful. van der Linden, D., te Nijenhuis, J., & Bakker, A. B. (2010). 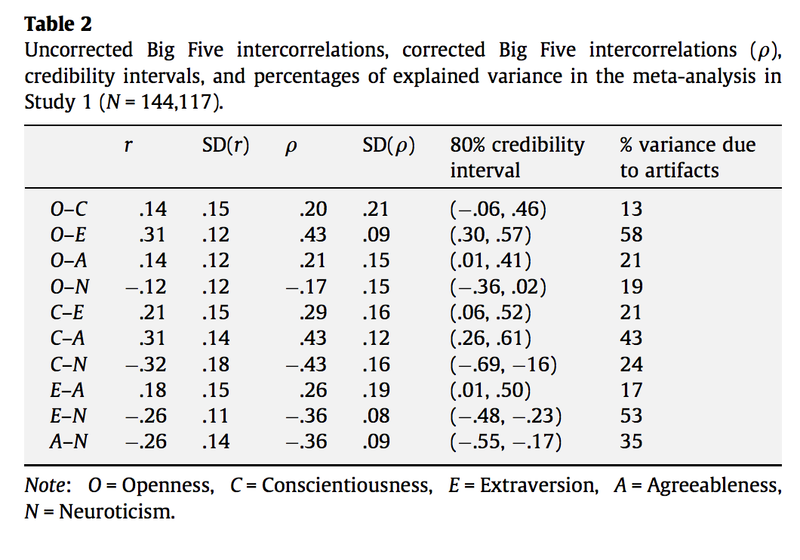 The general factor of personality: A meta-analysis of Big Five intercorrelations and a criterion-related validity study. Journal of Research in Personality, 44(3), 315-327. How do the correlations between Big 5 personality change in studies examining “faking bad”?